Are you looking for a unique way to show your appreciation to your customers, or a great addition to your branded offerings? Take a look at McGrath’s patented boxed gift sets. 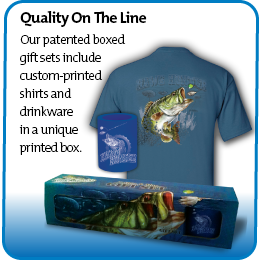 Every gift set includes a t-shirt and a koozie, mug or glass in a custom-wrap gift box that would stand out on any shelf. Each element of the gift set can be customized, or you can choose from any of our current special interest designs. T-shirt and mug? No problem. Golf shirt and koozie? Done. These distinct and flexible gift sets are limited only by your imagination. Click here or give us a call us a call at (815) 356-5246 to find out more about our gift sets and what we can do to put a package together for you.